Until now, developers of transparent solar cells have typically relied on expensive, brittle electrodes that tend to crack when the device is flexed. The ability to use graphene instead is making possible truly flexible, low-cost, transparent solar cells that can turn virtually any surface into a source of electric power. 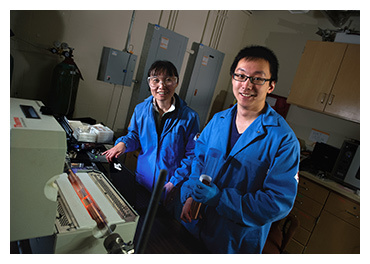 “It’s rare to find materials in nature that are both electrically conductive and optically transparent,” said Professor Jing Kong (pictured left) of the Department of Electrical Engineering and Computer Science (EECS). A promising alternative to ITO is graphene, a form of carbon that occurs in one-atom-thick sheets and has remarkable characteristics. It’s highly conductive, flexible, robust, and transparent; and it’s made from inexpensive and ubiquitous carbon. In addition, a graphene electrode can be just 1nm thick - a fraction as thick as an ITO electrode and a far better match for the thin organic solar cell itself. Two key problems have slowed the wholesale adoption of graphene electrodes. The first problem is depositing the graphene electrodes onto the solar cell. Most solar cells are built on substrates such as glass or plastic. The bottom graphene electrode is deposited directly on that substrate - a task that can be achieved by processes involving water, solvents, and heat. The other layers are then added, ending with the top graphene electrode. But putting that top electrode onto the surface of the so-called hole transport layer (HTL) is tricky. “The HTL dissolves in water, and the organic materials just below it are sensitive to pretty much anything, including water, solvents, and heat,” said EECS graduate student Yi Song (pictured right), a 2016-2017 Eni-MIT Energy Fellow and a member of Kong's Nanomaterials and Electronics Group. As a result, researchers have typically persisted in using an ITO electrode on the top. The second problem with using graphene is that the two electrodes need to play different roles. The ease with which a given material lets go of electrons is a set property called its work function. But in the solar cell, just one of the electrodes should let electrons flow out easily. As a result, having both electrodes made out of graphene would require changing the work function of one of them so the electrons would know which way to go - and changing the work function of any material is not straightforward. For the past three years, Kong and Song have been working to solve these problems. They first developed and optimised a process for laying down the bottom electrode on their substrate. Song decided that adding glue to the stamp might be the way to go - but not as a layer under the graphene. To test the idea, the researchers incorporated a layer of ethylene-vinyl acetate, or EVA, into their stamp, right on top of the graphene. The EVA layer is very flexible and thin - sort of like food wrap - and can easily rip apart. But they found that the polymer layer that comes next holds it together, and the arrangement worked just as Song had hoped: The EVA film adheres tightly to the HTL, conforming to any microscopic rough features on the surface and forcing the fine layer of graphene beneath it to do the same. “An aluminum electrode on the bottom will reflect some of the incoming light back into the solar cell, so the device overall can absorb more of the sun’s energy than a transparent device can,” said Kong. The PCEs for all their graphene/graphene devices - on rigid glass substrates as well as flexible substrates - ranged from 2.8 to 4.1%. While those values are well below the PCEs of existing commercial solar panels, they’re a significant improvement over PCEs achieved in prior work involving semitransparent devices with all-graphene electrodes, the researchers say. Measurements of the transparency of their graphene/graphene devices yielded further encouraging results. The human eye can detect light at wavelengths between about 400-700nm. The all-graphene devices showed optical transmittance of 61% across the whole visible regime and up to 69% at 550nm. “Those values [for transmittance] are among the highest for transparent solar cells with comparable power conversion efficiencies in the literature,” said Kong. To demonstrate that versatility, they deposited their graphene-graphene devices onto flexible substrates including plastic, opaque paper, and translucent Kapton tape. Measurements show that the performance of the devices is roughly equal on the three flexible substrates - and only slightly lower than those made on glass, likely because the surfaces are rougher so there’s a greater potential for poor contact. The ability to deposit the solar cell on any surface makes it promising for use on consumer electronics - a field that’s growing rapidly worldwide. For example, solar cells could be fabricated directly on cell phones and laptops rather than made separately and then installed, a change that would significantly reduce manufacturing costs. They would also be well-suited for future devices such as peel-and-stick solar cells and paper electronics. Since those devices would inevitably be bent and folded, the researchers subjected their samples to the same treatment. While all of their devices - including those with ITO electrodes - could be folded repeatedly, those with graphene electrodes could be bent far more tightly before their output started to decline. The researchers are now working to improve the efficiency of their graphene-based organic solar cells without sacrificing transparency. (Increasing the amount of active area would push up the PCE, but transparency would drop.) According to their calculations, the maximum theoretical PCE achievable at their current level of transparency is ten percent. “Our best PCE is about four percent, so we still have some way to go,” said Song. They’re also now considering how best to scale up their solar cells into the large-area devices needed to cover entire windows and walls, where they could efficiently generate power while remaining virtually invisible to the human eye. This research was supported by the Italian energy company Eni as part of the Eni-MIT Alliance Solar Frontiers Center. Eni is a Founding Member of the MIT Energy Initiative.